Mythologies are persistent – especially when they support present-day power realities. But the historical record is clear on the Yavneh myth: the rabbis neither “democratized” Judaism nor created it. In the centuries after the destruction of the Second Temple, rabbis spoke pretty exclusively to one another, as educated elites often do. What folks did both in and outside of the synagogue was certainly not determined and, in some respects, hardly affected by rabbinic conversations or prescriptions. The rabbis came into their own as powerbrokers only in the fifth and sixth centuries. In significant measure, we can thank Christianity for that development (that’s another post). Christianity posits a Satan and a Jesus foretold in Tanakh. We look at Mishnah and Gemara and invent a rabbinic leadership for the first five centuries of the Common Era that never was. This doesn’t make Talmud and the corpus of rabbinic texts unimportant. Not by any means. Once ensconced in positions of power, the rabbis did have a great deal to say about how Jews would live their lives. But even in those centuries, there was a dialogue between folk practice and rabbinic law. The latter not infrequently yielded to the former – just as it does in our own time. 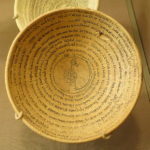 An ancient example: The incantation bowls of Babylonian Jewish society. Incantation bowls were a common phenomenon in the Ancient Near East – they likely hark back to Babylonian times (think Hammurabi and the 19th century BCE) when apotropaic figurines were buried at specific locations in both private and public dwellings. In Late Antiquity, incantation bowls were routinely buried in the four corners of a given dwelling or room, sometimes cupped together as a trap to contain demonic forces. 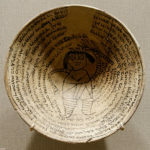 Inscriptions written on the inside of the bowls frequently name the people t o be protected as well as the various classes of threatening demonic characters. These were the liliths and the lilin, their male counterparts. Both engendered general misfortune and illness, and attacked adults using their powerful sexual wiles. Children were also presumed targets of these malevolent creatures. How on earth did those poor humans rid their houses of demons? By divorcing them. Or so we read in incantation bowl inscriptions. And again, do not appear to them, not in a dream of the night and not in sleep of the day, for I dismiss and separate you with a get of dismissal and a writ of separation and a letter of removal, according to the law of the daughters of Israel. The second inscription provides rabbinic authority, giving Joshua ben Perahia, a first-century B.C.E. rabbi, the credit for creating a get especially designed for demons. As in a rabbinic get, the names of both the mother and father of the being to receive it appear as part of the text. There’s shared ritual here and shared language, though the Talmudic sources are produced by an educated elite and the incantation bowls are a folk practice (one Christians, Mandeans, and other peoples of the time share with their Jewish neighbors). 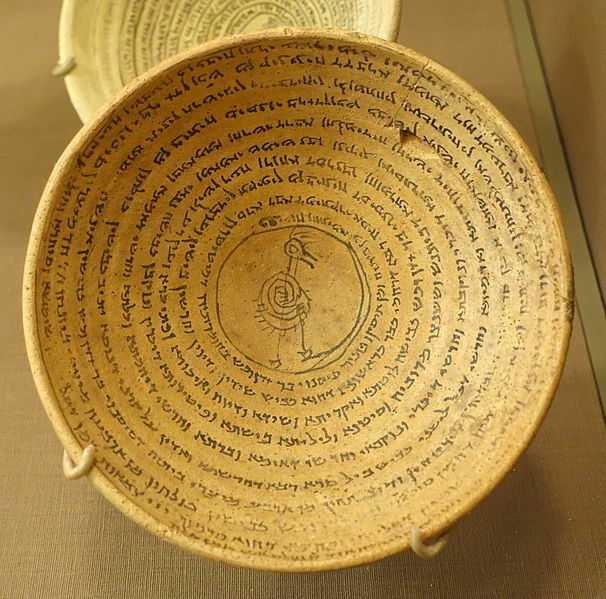 Some scholars wonder why rabbinic literature doesn’t mention the gets of incantation bowls. Amulets, after all, are discussed as aids in healing in Talmudic texts. Some wonder who drew the demons and wrote the incantations. One scholar in the field has speculated that women might have had significant roles to play in creating the inscriptions, and that women’s participation in this common practice may partially account for Talmudic claims that “most women are sorceresses” (b. Sanh. 67a). Rabbis, she claims, may be pushing back against female (and magical) practices. Rabbis probably never had the authority we imagine over the daily practices of their communities. They frequently don’t have that much authority now, either. This isn’t to say that in the fifth and sixth centuries Jewish communities hadn’t begun looking to their rabbis to respond creatively to their own needs. The get for demons could be a folk creation based on familiarity with rabbinic language. But it also could have been the work of a poor rabbinic student of the fifth century C.E. Maybe drawing and inscribing incantation bowls paid for that much-needed course on Jeremiah? The takeaway? It’s not really about folk practice versus rabbinic prescription. Jewish practice, Jewish learning, Jewish ritual, and Jewish traditions are intertwined and created anew each and every generation – by us all.